Gosford City Council town crier Stephen Clarke has been readying his voice, his moves and his outfit in preparation for the annual Australian Town Crier Championship. It is a special year in the event’s history, as it is being held in Parkes in conjunction with the 200th birthday celebrations of Sir Henry Parkes later this week. Among the festivities, Clarke and all of the town criers will have morning tea with Australia’s Governor-General, Sir Peter Cosgrove. 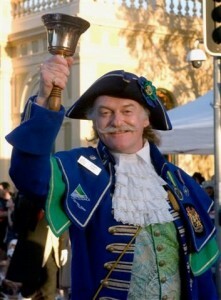 Clarke (pictured), Gosford’s town crier since 1990 and passionate about his city, has been busily preparing for the championship. “I’ve been hard at it researching, writing the cries and rehearsing them,” Clarke said. The first round of cries in the competition will be about Sir Henry Parkes and the second will be a “home cry”, where Clarke will deliver a proclamation about the city of Gosford. He said there were strict rules laid down by the Ancient and Honourable Guild of Australian Town Criers (AHGATC). “One wrong breath, word or inflection and you get marked down,” he said. “You’re judged on your posture, bearing, poise, confidence. In the 2012 championship Clarke took out first place for the best-dressed crier but is coy on his chances of repeating that feat this time round. “There are different judges each year so it just depends on their opinion,” he said. His regalia may not need to impress all the judges, however. Relatives of Parkes have travelled from England to celebrate the life and legacy of the “father of federation”.